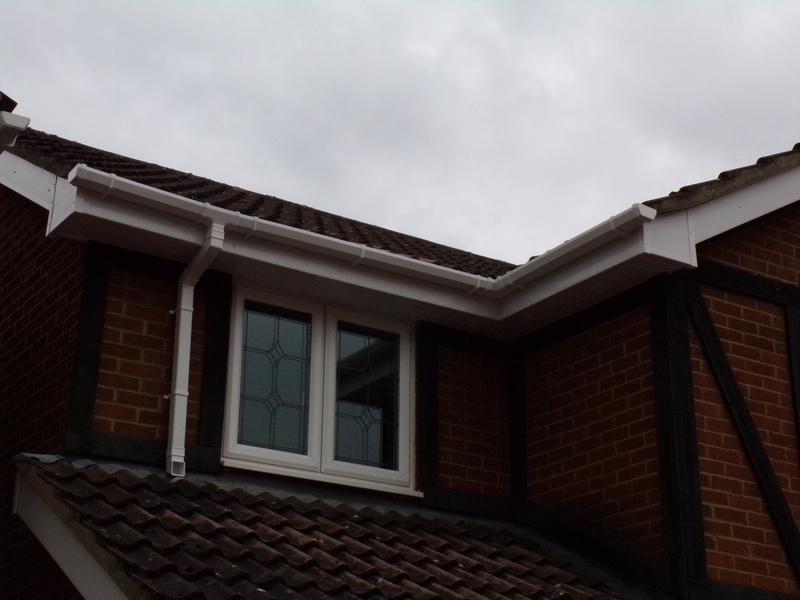 ASG uses Aquacel UPVC Fascia and Soffit Boards and Aquaflow Guttering for a first class finish to your property. All UPVC work is guaranteed for 10 years, and provides a clean looking, maintenance free solution for your roofline. UPVC capping fascia boards nail into the existing wooden fascia, and protects the wooden fascia from wear and tear, allowing a surface for the guttering to be fixed to. UPVC replacement fascia boards have the same purpose as capping boards, but where capping over wood isn’t possible, the wooden fascia is stripped and a thicker replacement board is nailed into the rafters of the house. 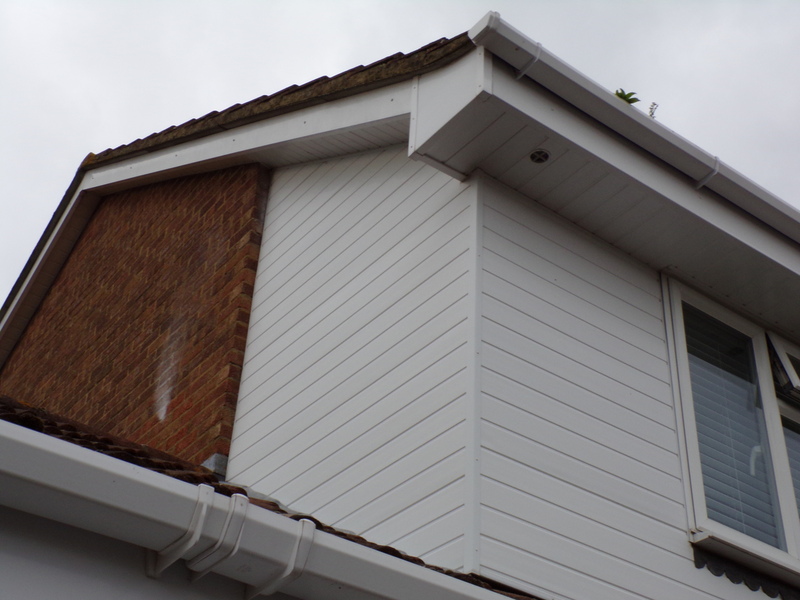 Soffit boards are fixed underneath the fascia board and prevent wet and damp from getting into your home. Soffit fixes into a UPVC wall trim and into the lip of the fascia for a clean finish. ASG’s UPVC soffit boards have plank effect design for a first class finish to your property. UPVC Cladding also fits in via wall trim, but is installed flat instead of underneath the fascia, as pictured above. Having a working guttering system is very important for the long term maintenance of your property; If water simply fell off the roof for a prolonged period it could eventually even damage the foundation of a house! ASG’s Aquacel brand guttering won’t corrode like old cast iron systems and weigh less, meaning they’ll last much longer. 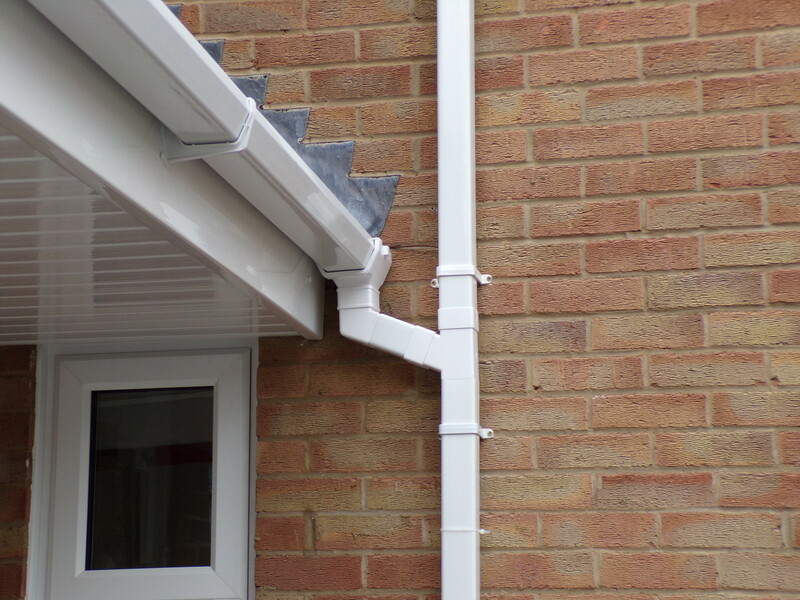 The guttering clips into rubber seals in the joins and outlets to prevent leaking, and like all our UPVC work guttering and downpipes are protected by our 10 years guarantee. It’s also important that gutters are regularly cleaned out to maintain them. EPS Drip trays fit underneath the end of the roof’s existing felt and run into the guttering. This ensures that if any felt becomes rotten or ripped that droplets of water fall onto the drip tray and into the guttering instead of causing problems inside the roof. ASG provide all of these UPVC services and more, if you would like a quote for your property, please don’t hesitate to get in touch and we will provide a free, no-obligation quote.